St. John’s Conservatory Theater has cast their fifth all original musical comedy KREEPY HALLOW based on Washington Irving’s classic short story THE LEGEND OF SLEEPY HOLLOW. 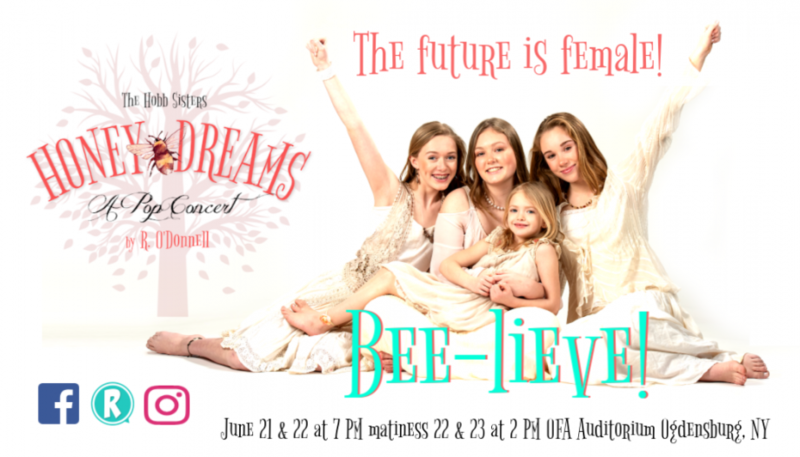 Cast with local talent from Ogdensburg, Huevelton, Morristown, and Gouverneur, KREEPY HALLOW stars Jillian LeBel as Alia Hobbs, Hailey Weber as Ravinia Hobbs and Parthenia Goste, Dee Bellinger as Etta Hobbs, Grace Brunet as Abitha Hobbs, R O’Donnell as narrator Brazillia R. Kreep, Angela Conzone Dwyer as Ichaboda Krane, Cole Siebels as Thaddeus Frye, Myah Myers as Felicity Caldwell, Christopher Rodriguez as Abner Frye, Haley Dawley as Mercy Faith, Grace Wills as Oheo Seneca, Megan Gardner as Chasity Smyth, Emma Murray as Charity Smyth, Christopher Dwyer as Bartholomeus Van tassel, Shelly Murdock as Electra Van Brunt, and Ryan Woodard as the Town Crier. KREEPY HALLOW is a goosepimply musical comedy featuring an original book, music and lyrics by award-winning playwright and composer Brazillia R. Kreep. His previous plays ALICE ISN’T ALL THERE and a KREEPY CHRISTMAS CAROL were well-received and reminiscent of Tim Burton’s Gothic ingenuity, well suited for this Halloween offering. Set in the 1860’s along the St. Lawrence River, when the first appointed female teacher, Miss Ichaboda Krane, takes over the ghostly schoolroom built on-top of a sacred Iroquois burial ground. With a classroom filled with eclectic children, her “eye” on Bartholomeus Van Tassel, a few unexpected guests, and a jealous local woman Electra Van Brunt watching her every move, Miss Ichaboda Krane’s Halloween celebration turns into a most haunting affair. Narrated by Brazillia R. Kreep himself, KREEPY HALLOW tells the tale of Ichaboda Krane’s encounter with all things that go bump in the night as the dreadful Headless Horseman rides again. With musical direction and choreography by Angela Conzone Dwyer, musical arrangements by Ryan C. McNally, set and prop designs by Stephen Chambers, costumes and makeup by Ann Losurdo and Karen Fischbeck Carmany, stage managed by Sadie Smith, technical direction and production coordination by Christopher Dwyer, and directed by R. O’Donnell, “Kreepy Hallow” promises to be a fun family affair. This entry was posted in in the news and tagged Episcopal, Gothic, humor, musical, Ogdensburg, St. John's, theater. Bookmark the permalink.